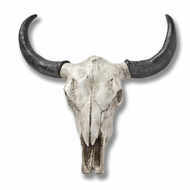 Statement-making style abounds with this resin large ox skull, an eye-popping addition to your decor collection. Its silhouette fits effortlessly into aesthetics ranging from bold boho and southwestern-inspired to casual and formal. Add this piece to the living room to complement a rustic arrangement.